Antoni Gaudí i Cornet (/ˈɡaʊdi/; Catalan: [ənˈtɔni ɣəwˈði]; 25 June 1852 – 10 June 1926) was a Spanish architect known as the greatest exponent of Catalan Modernism. Gaudí's works have a highly individualized, one-of-a-kind style. 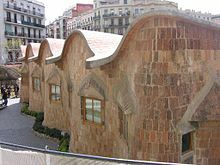 Most are located in Barcelona, including his main work, the church of the Sagrada Família. Gaudí had a deep appreciation for his native land and great pride in his Mediterranean heritage for his art. He believed Mediterranean people to be endowed with creativity, originality and an innate sense for art and design. Gaudí reportedly described this distinction by stating, "We own the image. Fantasy comes from the ghosts. Fantasy is what people in the North own. We are concrete. The image comes from the Mediterranean. Orestes knows his way, where Hamlet is torn apart by his doubts." Time spent outdoors, particularly during summer stays in the Gaudí family home Mas de la Calderera, afforded Gaudí the opportunity to study nature. Gaudí's enjoyment of the natural world led him to join the Centre Excursionista de Catalunya in 1879 at the age of 27. 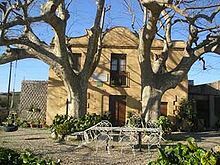 The organisation arranged expeditions to explore Catalonia and southern France, often riding on horseback or walking ten kilometres a day. The 1888 World Fair was one of the era's major events in Barcelona and represented a key point in the history of the Modernisme movement. 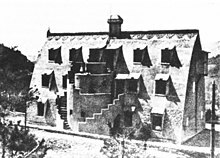 Leading architects displayed their best works, including Gaudí, who showcased the building he had designed for the Compañía Trasatlántica (Transatlantic Company). 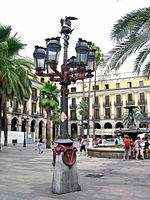 Consequently, he received a commission to restructure the Saló de Cent of the Barcelona City Council, but this project was ultimately not carried out. 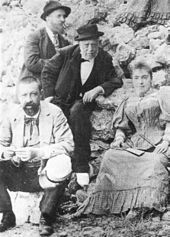 In the early 1890s Gaudí received two commissions from outside of Catalonia, namely the Episcopal Palace, Astorga, and the Casa Botines in León. These works contributed to Gaudí's growing renown across Spain. 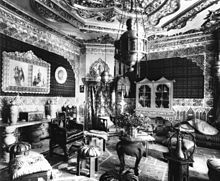 In 1891, he travelled to Málaga and Tangiers to examine the site for a project for the Franciscan Catholic Missions that the 2nd marquis of Comillas had requested him to design. 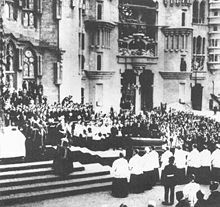 On 7 June 1926, Gaudí was taking his daily walk to the Sant Felip Neri church for his habitual prayer and confession. While walking along the Gran Via de les Corts Catalanes between Girona and Bailén streets, he was struck by a passing number 30 tram and lost consciousness. Assumed to be a beggar because of his lack of identity documents and shabby clothing, the unconscious Gaudí did not receive immediate aid. Eventually some passers-by transported him in a taxi to the Santa Creu Hospital, where he received rudimentary care. The same year Gaudí apparently took part in the construction of the Torre Damià Mateu, in Llinars del Vallès [es], in collaboration with his disciple Francesc Berenguer, though the project's authorship is not clear or to what extent they each contributed to it. The style of the building evokes Gaudí's early work, such as the Casa Vicens or the Güell Pavilions; it had an entrance gate in the shape of a fishing net, currently installed in the Park Güell. The building was demolished in 1939. Also in 1906 he designed a new banner, this time for the Guild of metalworkers and blacksmiths for the Corpus Christi procession of 1910, in Barcelona Cathedral. It was dark green in colour, with Barcelona's coat of arms in the upper left corner, and an image of Saint Eligius, patron of the guild, with typical tools of the trade. 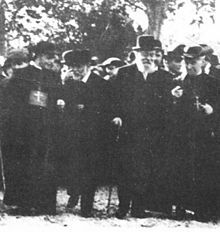 The banner was burned in July 1936. Gaudi was run down by a streetcar, and died in 1926. He is buried in the Sagrada Familia. After his death, Gaudí's works suffered a period of neglect and were largely unpopular among international critics, who regarded them as baroque and excessively imaginative. In his homeland he was equally disdained by Noucentisme, the new movement which took the place of Modernisme. 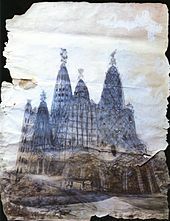 In 1936, during the Spanish Civil War, Gaudí's workshop in the Sagrada Família was ransacked, and a great number of his documents, plans and scale models were destroyed. Between 1950 and 1960, research and writings by international critics like George R. Collins, Nikolaus Pevsner and Roberto Pane spread a renewed awareness of Gaudí's work, while in his homeland it was admired and promoted by Alexandre Cirici, Juan Eduardo Cirlot and Oriol Bohigas. Gaudí's work has since gained widespread international appreciation, such as in Japan where notable studies have been published by Dr. Hiroya Tanaka (Gaudi Prize winner) , Kenji Imai and Tokutoshi Torii. International recognition of Gaudí's contributions to the field of architecture and design culminated in the 1984 listing of Gaudí's key works as UNESCO World Heritage Sites. Gaudí's style have subsequently influenced contemporary architects such as Santiago Calatrava and Norman Foster. Gaudi was the subject of the 1984 documentary Antonio Gaudi. ^ Massó 1974, pp. 17–18. ^ "Biography at Gaudí and Barcelona Club, page 1". Archived from the original on 16 October 2011. Retrieved 5 November 2005. ^ Mackay, David (1985). Modern architecture in Barcelona , 1854-1929. Archived from the original|archive-url= requires |url= (help) on |archive-url= requires |archive-date= (help). ^ Quiroga, Eduardo Daniel; Salomón, Eduardo Alberto. "Gaudí: Mecánica y forma de la naturaleza". Arquba.com (in Catalan). Archived from the original on 16 October 2011. Retrieved 29 August 2008. ^ Torres, I. Álvarez. "La Sagrada Familia de Barcelona ultima los preparativos para su apertura al culto". Lavoz Digital (in Catalan). Archived from the original on 16 October 2011. Retrieved 3 August 2008. ^ a b Tremlett, Giles (11 July 2003). "God's architect on road to sainthood". The Guardian. UK. Archived from the original on 16 October 2011. Retrieved 21 April 2011. ^ Klettner, Andrea (4 November 2010). "Pope's visit could fast-track Gaudí sainthood". Bdonline.co.uk. Archived from the original on 16 October 2011. ^ Castellar-Gassol 1999, p. 13. ^ Férrin 2001a, p. 61. ^ Bassegoda 1989, p. 26. ^ Massó 1974, p. 31. ^ Van Hensbergen 2004, p. 36. ^ Van Hensbergen 2004, p. 162. ^ Metello, Nuno (2008). "History of Vegetarianism—Antoni Gaudí (1852–1926)". International Vegetarian Union. Archived from the original on 18 October 2011. Retrieved 16 October 2011. ^ Castellar-Gassol 1999, p. 95. ^ Tarragona, Josep M. (24 November 2006). "El Arlequín". 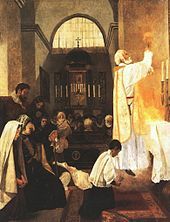 Antonigaudi.org (in Spanish). Archived from the original on 18 October 2011. Retrieved 3 August 2008. ^ Bassegoda 2002, p. 35. ^ Bassegoda 1989, pp. 24–25. ^ Bassegoda 2002, p. 36. ^ Bassegoda 2002, pp. 14–15. ^ Vargas, Judith Rodríguez. "Antoni Gaudí, la visión de un genio". Artes e Historia México (in Spanish). Archived from the original on 18 October 2011. Retrieved 3 August 2008. ^ Tarragona 1999, p. 11. ^ Tarragona 1999, p. 22. ^ Crippa 2003, p. 92. ^ Barjau, Santi (July 2002). "El complejo mundo de un creador obstinado". Barcelona Metròpolis Mediterrània (in Catalan). Archived from the original on 18 October 2011. Retrieved 3 August 2008. ^ Martinell 1975, p. 48. ^ Tarragona 1999, p. 235. ^ Tarragona 1999, p. 236. ^ Van Hensbergen 2004, p. 250. ^ Bassegoda 1989, p. 551. ^ Puig i Boada 1986, p. 166. ^ Tarragona 1999, p. 239. ^ Van Hensbergen 2004, p. 291. ^ Bonet i Armengol 2001, p. 21. ^ Tarragona 1999, p. 164. ^ "El gran amor inalcanzado de Gaudí". CTV.es (in Spanish). Archived from the original on 18 October 2011. Retrieved 3 August 2008. ^ "Amigos de Gaudí". 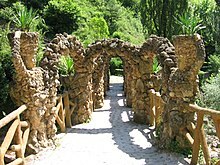 Gaudiallgaudi.com (in Catalan). Archived from the original on 18 October 2011. Retrieved 3 August 2008. ^ "Barcelona wishes Gaudi happy birthday". BBC News. 21 February 2002. Retrieved 4 November 2011. ^ "Gaudí: El arquitecto de Dios". ACIPrensa.com (in Spanish). Archived from the original on 18 October 2011. Retrieved 3 August 2008. ^ Zerbst 2002, p. 13. ^ Bassegoda 1989, p. 29. ^ Roe, Jeremy (2012). Antoni Gaudí. Parkstone International. p. 25. ISBN 9781780429670. ^ Tarragona 1999, p. 240. ^ Van Hensbergen 2004, pp. 304–305. ^ Férrin 2001a, p. 415. ^ Tremlett, Giles (2006). Ghosts of Spain. Faber and Faber, London. p. 351. ISBN 978-0-571-22169-1. ^ Bassegoda 2002, p. 263. ^ Puig i Boada 1986, p. 18. ^ Van Hensbergen 2004, p. 114. ^ Flores 2002, p. 58. ^ Saudi 2002, p. 44, Chapter: Els anys d'aprenentatge de Gaudí. ^ Flores 2002, p. 89. ^ Fontbona, Francesc (July 2002). "El vanguardismo de un tradicionalista". Barcelona Metropolis Mediterranea (in Spanish). Archived from the original on 18 October 2011. Retrieved 3 August 2008. ^ Flores 2002, pp. 38–39. ^ Bassegoda 2002, p. 198. ^ Bassegoda 2002, p. 266. ^ Puig i Boada 2004, p. 238. ^ Saudi 2002, p. 168, Chapter: Apunts sobre la intuïció científica de Gaudí. ^ Crippa 2003, p. 12. ^ Saudi 2002, p. 144, Chapter: Gaudí: geometria, estructura i construcció. ^ Flores 2002, pp. 91–92. ^ "Técnica arquitectónica de Gaudí". 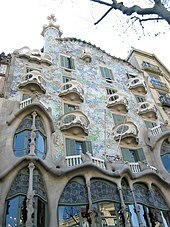 Gaudiallgaudi.com (in Spanish). Archived from the original on 18 October 2011. Retrieved 3 August 2008. ^ Bassegoda 1989, p. 16. ^ Bassegoda 1989, pp. 366–367. ^ Pibernat, Oriol (July 2002). "Diseño: entre el legado y la invención de la tradición". Barcelona Metropolis Mediterranea (in Spanish). Archived from the original on 18 October 2011. Retrieved 3 August 2008. ^ Férrin 2001b, p. 74. ^ Bassegoda 1989, p. 12. ^ Massó 1974, p. 40. ^ Giordano 2011, pp. 76–77. 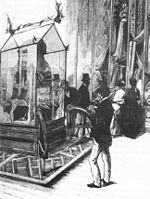 ^ "El mobiliario de Gaudí". Gaudiclub.com (in Spanish). Archived from the original on 18 October 2011. Retrieved 3 August 2008. ^ Puig i Boada 2004, p. 96. ^ Saudi 2002, p. 250, Chapter: Art, oficis i disseny en Gaudí. ^ Massó 1974, pp. 51–68. ^ Massó 1974, p. 51. ^ Bassegoda 2002, pp. 24–29. ^ Bassegoda 1989, p. 36. ^ Bassegoda 1989, p. 111. ^ Bassegoda 1989, p. 129. ^ Bassegoda 1989, p. 119. ^ Flores 2002, p. 26. ^ Bassegoda 1989, p. 139. ^ Bassegoda 2002, p. 57. ^ Bassegoda 1989, p. 156. ^ Bassegoda 1989, p. 161. ^ Bassegoda 1989, p. 181. ^ Van Hensbergen 2004, p. 93. ^ Bassegoda 1989, p. 183. ^ Bassegoda 1989, pp. 187–194. ^ Bassegoda 2002, p. 113. ^ Bassegoda 2002, p. 117. ^ Massó 1974, p. 52. ^ Bassegoda 2002, p. 107. ^ Crippa 2003, p. 15. ^ Bassegoda 2002, pp. 125–126. ^ Bassegoda 1989, p. 281. ^ Bassegoda 2002, p. 128. ^ Bassegoda 1989, p. 290. ^ Bassegoda 1989, p. 313. ^ "The 18th and 19th Centuries: Neoclassicism and Romanticism: Gothic Revival". All-art.org. Archived from the original on 18 October 2011. Retrieved 18 October 2011. ^ Massó 1974, p. 56. ^ Crippa 2003, p. 33. ^ Zerbst 2002, p. 94. ^ Bassegoda 2002, p. 150. ^ Crippa 2003, p. 37. ^ Bassegoda 2002, p. 155. ^ Bassegoda 1989, p. 333. ^ Bassegoda 2002, p. 165. ^ Crippa 2003, p. 49. ^ Massó 1974, p. 60. ^ Férrin 2001a, p. 241. ^ Bassegoda 1989, p. 375. ^ Van Hensbergen 2004, p. 272. ^ Bassegoda 1989, p. 425. ^ Bassegoda 2002, p. 176. ^ Zerbst 2002, p. 150. ^ Massó 1974, p. 79. ^ Bassegoda 1989, p. 435. ^ Zerbst 2002, p. 221. ^ Bassegoda 2002, p. 184. ^ Bassegoda 2002, p. 187. ^ Bassegoda 1989, p. 471. ^ Saudi 2002, p. 271, Chapter: Gaudí i els seus coŀlaboradors: artistes i industrials a l'entorn del 1900. ^ Bassegoda 1989, p. 469. ^ Bassegoda 2002, p. 214. ^ Bassegoda 1989, p. 507. ^ Bassegoda 1989, p. 509. ^ Férrin 2001a, p. 296. ^ Bassegoda 1989, p. 529. ^ Bassegoda 1989, p. 531. ^ Bassegoda 1989, p. 370. ^ Massó 1974, p. 68. ^ Crippa 2003, p. 79. ^ Bassegoda 1989, p. 555. ^ Massó 1974, p. 49. ^ Bassegoda 1989, p. 495. ^ Zerbst 2002, p. 198. ^ Tremlett, Giles (22 September 2011). 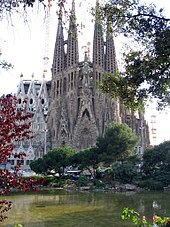 "Sagrada Família gets final completion date – 2026 or 2028". The Guardian. Retrieved 13 October 2011. ^ Bassegoda 1989, p. 563. ^ Bassegoda 1989, p. 565. ^ Bassegoda 1989, p. 581. ^ Férrin 2001b, p. 47. ^ Kassam, Ashifa (17 January 2015). "Chile's Gaudi plan gets off the drawing board". The Guardian. ^ "Colaboradores de Gaudí". 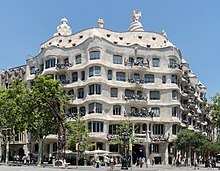 Gaudiallgaudi.com (in Spanish). Archived from the original on 18 October 2011. Retrieved 3 August 2008. ^ Bassegoda, Juan. 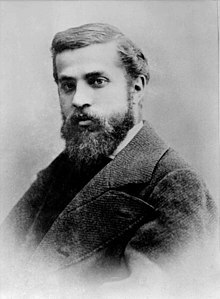 "Antoni Gaudí Cornet (1852–1926)". Instituto Cervantes (in Spanish). Archived from the original on 18 October 2011. Retrieved 3 August 2008. ^ Massó 1974, p. 9. 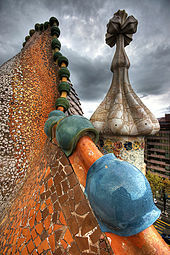 ^ "The Gaudí effect". (The Guardian). 16 January 2006. Retrieved 18 December 2011. ^ "Gaudi Mania". Time Magazine. 11 March 2002. Retrieved 18 December 2011. ^ Sheridan, Molly (28 February 2002). "A Rousing Night at the Grammy Awards". NewMusicBox. Retrieved 7 June 2015. ^ "Beatificación de Gaudí". Sagrada Familia (in Spanish). Archived from the original on 18 October 2011. Retrieved 3 August 2008. ^ Ramón-Cortés, Sílvia; Borderías, Sílvia (24 November 2008). "Presentation of the Gaudí Awards of Cinema" (PDF). Academy of Catalan Cinema. Archived from the original (PDF) on 18 October 2011. Retrieved 16 October 2011. ^ "8th Session of the UNESCO World Heritage Committee". UNESCO. 2 November 1984. Archived from the original on 18 October 2011. Retrieved 3 August 2008. ^ "29th Session of the UNESCO World Heritage Committee" (PDF). UNESCO. 9 September 2005. Archived (PDF) from the original on 18 October 2011. Retrieved 3 August 2008. ^ "World Heritage: Works of Antoni Gaudí". UNESCO. 2 November 1984. Archived from the original on 18 October 2011. Retrieved 25 August 2008. Bassegoda, Juan (1989). El gran Gaudí (in Spanish). Barcelona: Sabadell. ISBN 978-84-86329-44-0. Bassegoda, Juan (2002). Gaudí o espacio, luz y equilibrio (in Spanish). Madrid: Criterio Libros. ISBN 978-84-95437-10-5. Bergós, Juan; Bassegoda i Nonell, Joan; Crippa, Maria Antonietta; Llimargas i Casas, Marc (2002). Gaudí, l'home i l'obra (in Catalan). Barcelona: Círculo de Lectores. ISBN 978-84-9785-783-3. Bonet i Armengol, Jordi (2001). L'últim Gaudí: el modulat geomètric del Temple de la Sagrada Família (in Catalan). Barcelona: Pòrtic. ISBN 978-84-7306-727-0. Castellar-Gassol, Juan (1999). Gaudí, la vida d'un visionari (in Catalan). Barcelona: Edicions de 1984, S. L. ISBN 978-84-86540-54-8. Crippa, Maria Antonietta (1 October 2003). Gaudí (in Spanish). Cologne, Germany: Taschen GmbH. ISBN 978-3-8228-2519-8. Férrin, Ana María (2001a). 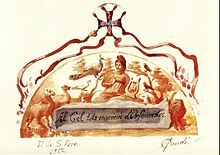 Gaudí, de piedra y fuego (in Spanish). Barcelona: Jaraquemada. ISBN 978-84-932015-0-0. Férrin, Ana Maria (2001b). Gaudí: la huella de genio (in Spanish). Barcelona: Jaraquemada. ISBN 978-84-932015-1-7. Flores, Carlos (2002). Les lliçons de Gaudí (in Catalan). Translated by Glòria Bohigas. Barcelona: Empúries. ISBN 978-84-7596-949-7. Giordano, Carlos (2007). Gómez Gimeno, Mária José (ed.). Templo expiatorio de La Sagrada Familia: la obra maestra de Antoni Gaudí (in Spanish). Barcelona: Mundo Flip. Giordano, Carlos (2011). Gómez Gimeno, Mária José (ed.). The Basilica of the Sagrada Familia: the masterpiece of Antoni Gaudí. Translated by Cerys R. Giordano Jones. Barcelona: Dos de Arte. Giralt-Miracle, Daniel, ed. (2002). "Art, oficis i disseny en Gaudí". Gaudí 2002. Misceŀlània (in Catalan). Barcelona: Planeta. ISBN 978-84-08-04332-4. Martinell, Cèsar (1967). Gaudí, Su vida, su teoría, su obra (in Spanish). Barcelona: Colegio de Arquitectos de Cataluña y Baleares. Comisión de Cultura. Martinell, Cèsar (1975). Gaudí: his life, his theories, his work. Translated by Judith Rohrer. Cambridge, Massachusetts: The MIT Press. ISBN 978-0-262-13072-1. Massó, Juan Bergós (1974). Gaudí, l'home i la obra (in Catalan). Barcelona: Universitat Politècnica de Barcelona. ISBN 84-600-6248-1. Müller, Frederike; Wendt, Lars (Directors) (2006). The Architect Antoni Gaudí. Myth and Reality (DVD) (in German). Germany: WendtFilm & Ciné Canard. Puig i Boada, Isidre (1986). El temple de la Sagrada Família (in Catalan). Barcelona: Thor, D.L. ISBN 978-84-282-1557-2. Puig i Boada, Isidre (1 October 2004). El pensament de Gaudí (in Catalan). Barcelona: Dux Editorial, S. L. ISBN 978-84-609-1587-4. Puig i Tàrrech, Armand (2010). La Sagrada Família segons Gaudí: comprendre un símbol (in Catalan). Barcelona: Pòrtic. Saudi, Antoni (2002). "Gaudí i els seus coŀlaboradors: artistes i industrials a l'entorn del 1900". In Casanova, Rossend (ed.). Gaudí 2002. Misceŀlània (in Catalan). Barcelona: Planeta. ISBN 978-84-08-04332-4. Stone, Peter (3 May 2011). Frommer's Barcelona. Chichester, UK: Frommers. ISBN 978-0-470-09692-5. Tarragona, Josep María (1999). Gaudí, biografia de l'artista (in Catalan). Barcelona: Proa. Tarragona, Josep María (2011). Antoni Gaudí, un arquitecto genial (in Spanish). Barcelona: Casals. ISBN 978-84-218-2430-6. Van Hensbergen, Gijs (7 January 2004). Antoni Gaudí (in Spanish). London, UK: Debolsillo. ISBN 978-84-9793-010-9. Wagensberg, Jorge, ed. (2002). "Apunts sobre la intuïció científica de Gaudí". Gaudí 2002. Misceŀlània (in Catalan). Barcelona: Planeta. ISBN 978-84-08-04332-4. Zerbst, Rainer (2002). Gaudí, 1852–1926: Antoni Gaudí i Cornet: a life devoted to architecture. Cologne, Germany: Taschen. ISBN 978-3-8228-2171-8.